It's a not-so rosy report card for the nation's schoolchildren. Math scores slipped for fourth and eighth graders over the last two years, and reading grades were not much better, flat for fourth graders and lower for eighth graders, according to the 2015 Nation's Report Card. The results of the test, officially known as the National Assessment of Educational Progress or NAEP, were released Wednesday. The report suggests students have a ways to go to demonstrate a solid grasp or mastery of their reading and math skills. Only about a third of the nation's eighth-graders were at proficient or above in math and reading. Among fourth graders, the results were slightly better in reading and in math, about two in five scored proficient or above. And the report found a continuing achievement gap between white and black students. There were a few bright spots. The District of Columbia and Mississippi both saw substantial gains in reading and math. Education Secretary Arne Duncan urged parents, teachers, and others not to panic about the scores as states embrace higher academic standards, such as Common Core. "We should expect scores in this period to bounce around some, and I think that 'implementation dip' is part of what we're seeing here," Duncan said in a phone call with reporters. "I would caution everyone to be careful about drawing conclusions ... anyone who claims to have this all figured out is pedaling a personal agenda, rather than an educational one." Reacting to the scores, Chris Minnich, executive director of the Council of Chief State School Officers, said one year's worth of data shouldn't send the nation's schools and teachers off in a different direction. "Having the higher academic standards caused the states and teachers and districts to change the way they're teaching certain things," Minnich said in an interview. "We may be in a place where some of the questions that are asked on this national test aren't being taught at the same time they were being taught before." The Common Core standards were developed by the states with the support of the administration. They spell out what students should know in English and math at each grade level, with a focus on critical thinking and less of an emphasis on memorization. But they have become a rallying point for critics who want a smaller federal role in education and some parents confounded by some of the new concepts being taught. The NAEP tests don't align completely with Common Core, but NAEP officials said there was "quite a bit" of overlap between the tests and college-ready standards. —36 percent of fourth graders were at or above the proficient level in reading, about the same as 2013. Only 34 percent of eighth-grade students were proficient or better in reading, a two-point drop. But both measures were sharply higher than 1990 results. —40 percent of fourth-grade students were at or above proficiency in math this year. That's down two points from 2013, and marks the first decline for that measure since 1990. For eighth graders, only 33 percent of students were proficient or better in math, also a two-point decline. —Fourth-grade math scores were higher in the District of Columbia and Mississippi — up three points for each. In 16 states, scores dropped. They were flat in the rest. In eighth-grade math, there were no gains across the states, and 22 states had lower scores than in 2013. —For reading, scores were higher for fourth-graders in 13 states and jurisdictions, including the District of Columbia — up seven points. Mississippi and Louisiana were also higher, both states up six points. 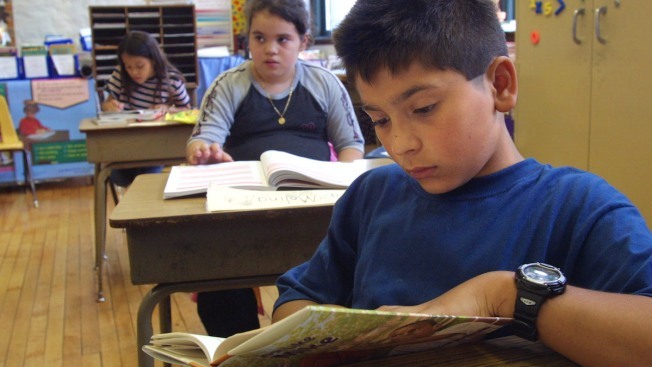 At the eighth-grade level, reading improved only in West Virginia, up three points from 2013. —There were no significant changes in the achievement gap for reading between white students and their black and Hispanic peers. But for math, there was a small narrowing in the gap between white fourth graders and their black peers. The average score for white students was 24 points higher, slightly smaller than the 26-point gap in 2013. The results of the report comes on the heels of President Barack Obama's call for capping standardized testing at two percent of classroom time. Currently, students spend about 20 to 25 hours a school year taking standardized tests and just how much class time students spend preparing for these mandatory tests is yet to be known. Cecilia Munoz, the director of the White House's Domestic Policy Council, said his group found examples of testing redundancy that could be cut to create more instructional time. For example, some states and school districts were requiring both end-of-year tests and end-of-course tests in the same subjects in the same grade. Obama said the government must take responsibility for turning tests into the "be-all and end-all of American schools." "Learning is about so much more than just filling in the right bubble," Obama said in a video released on Facebook Saturday. "So we're going to work with states, school districts, teachers, and parents to make sure that we're not obsessing about testing."